Sampling J.P. Morgan's aesthetic treasures, which numbered more than 20,000 items. Legendary financier J. Pierpont Morgan was also a renowned collector. In the 23 years before his death in 1913, a few weeks shy of his 76th birthday, he acquired more than 20,000 items. But what kind of collector was he? "Morgan: Mind of the Collector," a display of about 110 of those objects, attempts to answer that question. Pegged to the 100th anniversary of a gift of 1,350 items to the Wadsworth Atheneum here, arranged by his son Jack in fulfillment of Morgan's will, the exhibition wisely goes beyond that donation. It borrows many works from Morgan's other main beneficiaries, the Metropolitan Museum of Art and the Morgan Library and Museum, and adds some other objects he once owned. Morgan chased after certain categories avidly, sometimes buying entire collections as well as individual items. But he also exercised restraint. Once he felt he was finished in an area, he commissioned a limited-edition, leather-bound catalog for it and circulated copies to museums, dealers, scholars and friends. Some examples are shown here. As they reveal, he would take up an interest with laser-beam focus, making purchases that astonish in sheer number: 1,157 ancient Near East cylinder seals; 3,000 cuneiform tablets; 600 rare Medieval manuscripts; more than 800 portrait miniatures; 250 watches and clocks; the largest collection of Rembrandt etchings in the U.S.; nearly 250 Renaissance and Baroque bronze sculptures; the "most complete" collection of painted Renaissance enamels extant during his lifetime; more than 1,500 pieces of Chinese, Meissen, Sèvres and other porcelain; and about 130 snuff boxes. He bought paintings, glass, tapestries, on and on. To make sense of these many pursuits, curator Linda Roth has focused mostly on decorative arts and on three often overlapping themes: antiquities, sacred treasures and historical objects. His interest in ancient civilizations shines through in objects like a stately bronze cat (third to first century B.C.) alluding to the Egyptian goddess Bastet; a Coptic manuscript on God's mercifulness (c. 465-538), one of more than 50 he purchased in 1911; and a Greek silver drinking cup (second century B.C.). His religiosity—Morgan was an Episcopalian who went to church every Sunday, Ms. Roth says—is amply demonstrated with an ornate Italian gilded reliquary (14th and 15th centuries) holding a tooth of Mary Magdalene and a 14th-century German tapestry fragment depicting the Crucifixion, to name just two. As for history, Morgan bought a seemingly simple silver tankard (1673/74) that is engraved with scenes of the Great Fire of London and the Great Plague and happens to be one of six such mugs commissioned by Sir Edmund Berry Godfrey known to exist. He owned an autograph letter from George Washington to James Madison dated May 20, 1792, an ornamental case thought to have been once owned by Marie Antoinette, and a gold-and-diamond snuff box commissioned by Frederick the Great (1745-55). But even this small sampling of Morgan's possessions frequently bursts its categorical boundaries, and might be analyzed in other ways. Morgan clearly had an eye for beauty, for instance, as seen in many dazzling examples. An intricately carved German ivory triptych (1325-50), still tinged with traces of gilt and polychrome decoration, depicts an angel crowning Mary, who beams a smile as she makes eye contact with the baby Jesus resting in her arm. 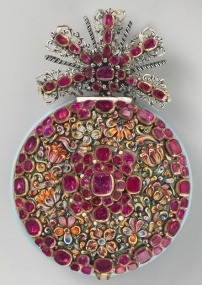 The "Great Ruby Watch" (c. 1670), by German watchmaker Nicolaus Rugendas the Younger and adorned with 85 rubies, seems a little gaudy for such a small object (less than two inches in diameter), but it is redeemed by exquisite gold and enamel work. And a brilliantly colored Limoges enamel-on-copper scene (c. 1530-35), "Helenus and Andromache Give Presents to Aeneas" from Book III of the Aeneid, is sensational. Morgan also appreciated importance. He bought a rare Bible (1663) translated into the Native American Massachusett language as well as what was then (1902) the only version of St. Augustine's "City of God" (printed 1486/87) in America. Morgan frequently sought expert advice, but at times exerted his independent judgment. One scene-stealing object is a rare Roman cup (c. A.D. 1-99), just 2.5 inches tall. 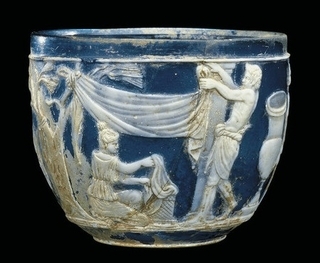 It's a white-on-blue cameo glass depicting a woman making an offering to Silenus in hopes of becoming pregnant, and Morgan bought it at auction in Paris (outbidding the Petit Palais and Baron Edmond de Rothschild ) against the advice of curators from the Metropolitan Museum, who questioned its authenticity. But Morgan was right, and "the Morgan Cup" is now in the collection of the Corning Museum of Glass. On the other hand, he purchased a graceful bronze angel (1475) by Jean Barbet partly because he thought it was from a weather vane at Sainte-Chapelle in Paris. Actually, it was (probably) part of a fountain or altar, but Morgan loved it anyway and "always kept it close to him." Ordinarily, you can see it at the Frick Collection. Such a capacious collecting "mind" as Morgan's, with so many rooms, nooks and crannies, cannot possibly be communicated fully in 110 objects. But give the Wadsworth credit for undertaking it in a captivating exhibition nonetheless.